Ask fellow campers about "Rapid City / Black Hills KOA" and nearby attractions. It looks like a lot of money has been spent on this park recently. Some of the sites have patios with nice tables and chairs (not picnic tables) and bbq grills. The buildings all look new or remodeled. Our site didn't have sewer but had a shelter over the picnic table to provide some shade. We did have a couple complaints, both fairly minor. They charged a $2 pet fee - for what, I don't know. And while they had 4 WiFi networks, none of them worked worth a darn. I had to use my T-Mobile service to post this review. The location is convenient to the interstate and Mount Rushmore and the Crazy Horse Memorial. We would stay here again. We camped at Rapid City / Black Hills KOA in a Motorhome. Large KOA, busy, filled up every night. Quiet, top of hill. Accomodating front office. Adequate site spacing. Has rental cars, something I wish all KOAs had. Good OTA TV, but campground wifi was nonexistent, plenty of signal, but slow, slow! We camped at Rapid City / Black Hills KOA in a Motorhome. Do not attempt to tour the Black Hills unless you have a tow vehicle. I used Black Hills Tours, which picked me up at the campground. The tour was excellent, lasted about ten hours, included lunch and snacks. It was an excellent way to pack a lot of sightseeing in one day (Mt Rushmore, Custer State Park, Needle Highway, Crazy Horse, etc) and not have to worry about driving. We just spent one night so we didn't use any of the facilities. Staff was friendly and efficient. They charge $2.00 a day per pet. I just don't get that. We camped at Rapid City / Black Hills KOA in a Motorhome. 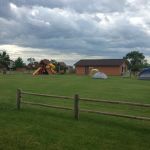 The campground is easy access from I-90 and about 10 minutes off the main highway. The roads up into the park are paved and the roads throughout the park and sites are gravel. The registration area is a bit small for the amount of traffic that comes into and out of the CG. Several times there were traffic jams in this area. The CG is quite large and has sites of all types and cabins scattered throughout. There are also trees scattered throughout with some shaded sites and some open sites. We drive a 45 foot MH with a tow and got into, through, and out of the CG without difficulty. We stayed in the premium site section and the sites are packed gravel and long. There is grass between sites and in this section a fair distance to the next coach. Sites in other areas of the park were closer together. Utilities are to the rear of the site and worked well. We had good satellite reception and there are numerous OTA channels. The Wi-Fi was slow to impossible so we used out Verizon hot spot which was adequate. We did not use the laundry, rest rooms or pool area so cannot comment on these. There is a specific dog walk area. As with many KOAs there seemed like tons of things for kids to do and the little train ran regularly. The office receptionist was very busy yet friendly and helpful. As with most KOAs, it is expensive to stay but we would use this campground again. We camped at Rapid City / Black Hills KOA in a Motorhome. Custer State Park Wildlife Loop Road and Needles Highway are a must! A little pricey for a park not near the National Parks. Since we don't tow, Enterprise was very close for our side trips. Lots of grass between sites, BUT the roads into them is mostly dirt. Since it's thunderstorm season they become quite muddy making it challenging to keep it out of your rig. The roads into the sites are quite narrow, especially with 5th wheel tow vehicles encroaching into or near the road. If you have a 40+ foot rig, be prepared unless you are in the "premium" sites with more room. On Friday nights during the summer there is auto racing about a mile away which made sitting outside nearly impossible. Since our stay was during the Deadwood motorcycle rally weekend and 3 weeks before Sturgis, thry were everywhere but not much at night. The pool area is always full of kids so we did not use. 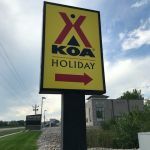 We camped at Rapid City / Black Hills KOA in a Motorhome. The park has an ala-carte breakfast every morning from 7-10am. There is also an adult function every evening. Since the park is on a hill the premium sites have nice views of the city. Stayed 6 nights. They have a couple of cars to rent if needed, which is nice. Well organized, easy in and set up. Bathroom and showers and laundry were very clean. We camped at Rapid City / Black Hills KOA in a Motorhome. Town was about 2 miles away Gas/Convenience store 3 blocks away. We stayed in a 32" 5th wheel. The campground is on high ground and drained well. The sites were well maintained. The cable TV worked well but only had about 20 channels. WiFi was good and reasonably fast. The staff was very friendly and helpful. The interior roads were gravel, the staff kept them watered to keep down the dust. 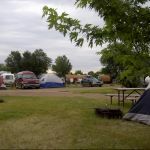 The campground is located in Rapid City which offers great entertainment and dining choices but you have a lot of traffic noise to contend with. 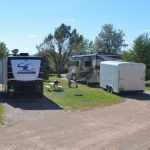 We camped at Rapid City / Black Hills KOA in a Fifth Wheel. Many attractions in the Black Hills area, the scenic drives are terrific. An unplanned stop on our way to Theodore Roosevelt NP. Arrived well after office hours in the dark and cold drizzle. Our check-in papers and map were all ready and left for us at the night-arrival kiosk. Finding our way to our back-in spot and setting up was no problem. The hot breakfast service in the morning was just what the Dr. ordered after a chilly and rainy night/morning. 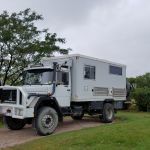 The staff was outstanding and really helpful in getting us directed to services in town for our ailing RV, which needed help from a VW dealership tech. 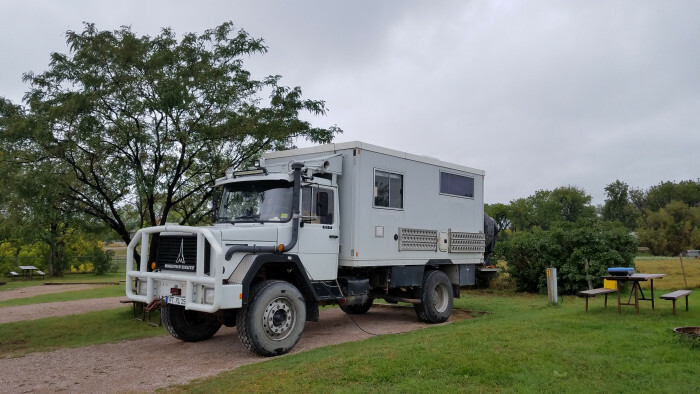 Woke up the next day with a crazy European overland adventure mobile a few spots away. Looked like they were ready for the Zombie Apocalypse! Check-out and dump station, and propane sales at our departure were smooth and efficient. Would definitely stay here again. We camped at Rapid City / Black Hills KOA in a Motorhome. A day trip through Custer SP and Wind Cave NP is a must! There are definitely pros and cons for this place. We're in a 42' fifth wheel, and needed a place close to the airport. The good first - nice staff, grounds were pretty well maintained (I didn't get the impression it was in disrepair as other reviews said). All you can eat pancake breakfast for $2.99 every day, activities every night, including wine tasting Friday nights! Pool very clean, fenced in dog area, two laundry rooms (we used the back one near dog park). Only had 30 amp sites available, very few 50 amps on the map. Even parked at the back of the site, we still had to use a 20' sewer hose with a 10' extension. There was a dip and then an uphill slope to the sewer hookup, so we had to walk the hose to dump. Dryers in laundry room didn't work very well, so basically had to keep feeding quarters. The biggest 'con' for me was the pet fee: $2 a pet, per day. They never said anything about a fee when they asked if we had pets (most places do ask if you have pets, none have ever charged us though). So we paid $24 for our two dogs to sit and stare out the window. For that reason alone, we won't come back. We camped at Rapid City / Black Hills KOA in a Fifth Wheel. Big rig friendly. Lots of places to walk the dog. Family friendly. Stayed 2 days so we could visit the Badlands. A Must see for sure. The only negative for me was the location of the sewer. When pulled all the way forward to get jeep out of the road I was too far from the sewer. Disconnected and backed up. Not a big deal. We camped at Rapid City / Black Hills KOA in a Motorhome. We spent 3 weeks in this KOA and enjoyed our stay. We used this location as a base for visiting the area. Campground was clean and very friendly staff. Only real issue was that the wind was almost always constant and made for difficult outdoor experiences at times. Sites are easy to drive into/out of even with a long RV (44' 5th wheel). We camped at Rapid City / Black Hills KOA in a Fifth Wheel. Very run down park, substantial deferred maintenance. Virtually zero rock at sites and roads. It rained and my site was a muddy mess with standing water/poor drainage. Entire facility was the same. I stay at 40+ parks a year and this is the second worse I have experienced. Unfortunate, good location with services (restaurants, grocery, etc.) in reasonable close proximity. 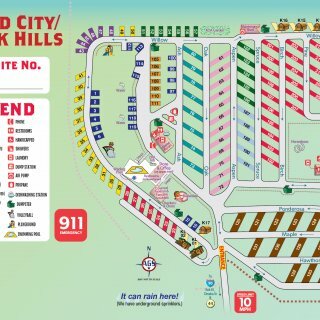 I would recommend considering one of the many other RV parks in the local area. We camped at Rapid City / Black Hills KOA in a Motorhome. With a few miles are many restaurants and general shopping. While this park is close to a few attractions and the staff is friendly, it is a run down dump of a park. The website's directions to the park are obtuse and your GPS, they warn, will probably lead you to some very odd destinations. If you must stay here, call ahead and make sure you understand how to get here. We camped at Rapid City / Black Hills KOA in a Motorhome. Do not miss Bear County USA. The park is overpriced for a 30 amp electric/water site and the sites are very close together. The fire ring on the site next to us was right under our bedroom window. Interior roads are narrow and the sites are so narrow we had trouble getting into our site. The sites have covered picnic tables and we narrowly missed hitting it trying to get in and we could not open up our awning. No cable TV at our site and wifi (Tengo) wasn't very good. Would not stay here again. We camped at Rapid City / Black Hills KOA in a Fifth Wheel. Convenient location for day trips to Mount Rushmore, Custer State Park and Crazy Horse Memorial. We only used this for a stopover, but the campground looked nice. I only gave it an 8 because the RV's were packed in pretty tight. WIFI worked well for us, as well as the laundry. Restrooms were as clean as can be expected (4th of July) too. It was an easy check-in process and were easily able to leave quickly & quietly in the morning. Overall a good experience. We camped at Rapid City / Black Hills KOA in a Travel Trailer. We had never been to the Black Hills before. Allow plenty of time to see things there as there are lots of places to go besides Mt Rushmore. Also the Badlands NP is very much worth the drive. Lots to do in this area. Tours of Mt. Rushmore, Black Hills, Needles Hwy., wineries, shopping. 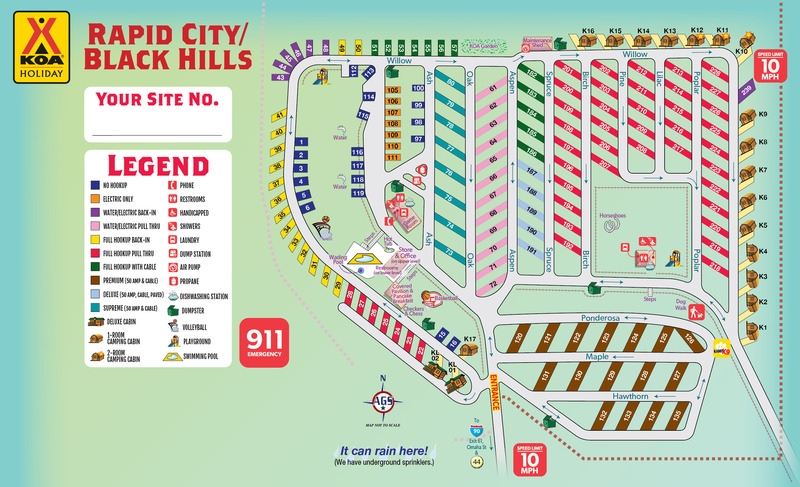 Stay in one of the premium sites down the hill on the right side when you enter. They are numbered 120 - 135 on the campground map. Lots of things to see in the Badlands area. Close to grocery store and restaurants. Cabala is very close for shopping too. 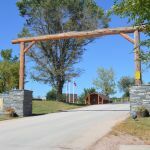 Are you affiliated with Rapid City / Black Hills KOA ?